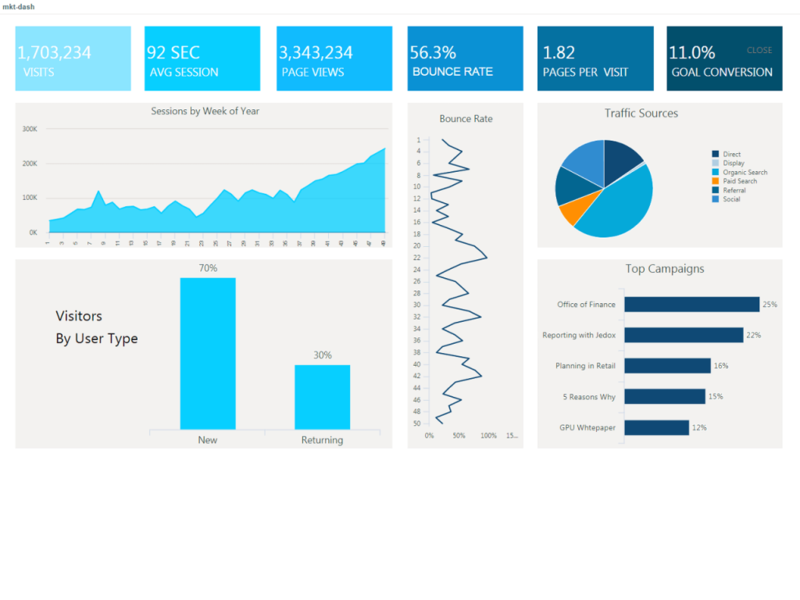 Jedox Suite is a flexible BI and CPM product for planning, reporting and analysis. 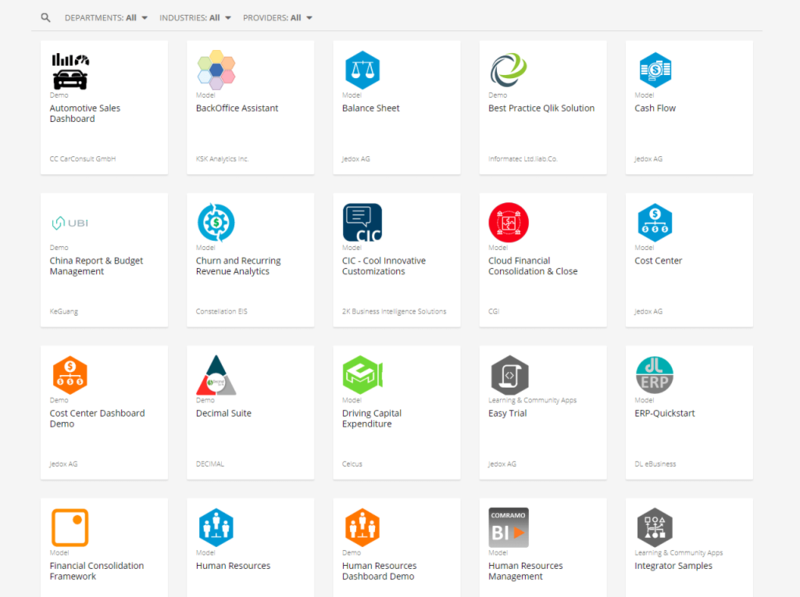 The suite, which runs on the company’s own multidimensional database, is designed for business users. The underlying philosophy of Jedox Suite is to extend the familiar Excel environment with specific BI and planning functionality. 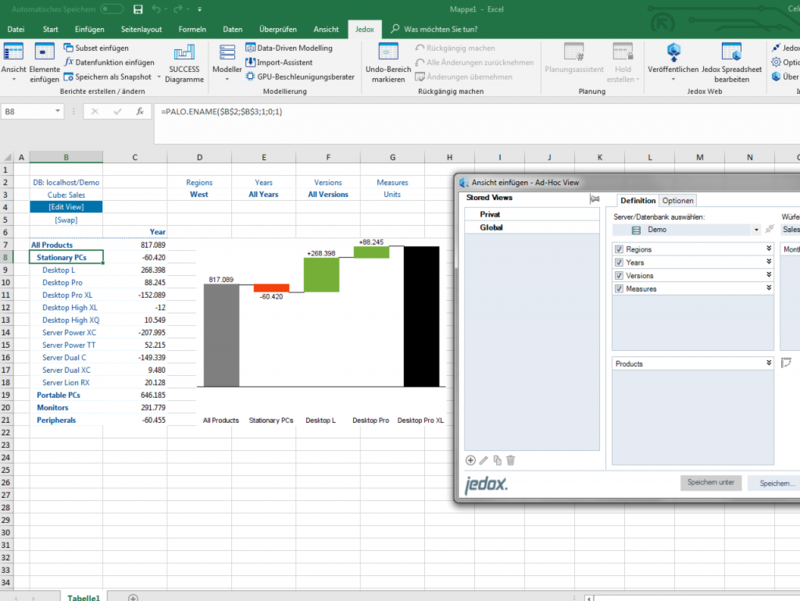 The solution offers both an Excel client and a web interface resembling a spreadsheet as front ends. The company’s flagship product is Jedox Suite, a flexible BI and CPM product with planning, reporting and analysis capabilities. The solution, which offers both an Excel client and web interface as front ends, was first launched in 2004. The product is aimed at business power users who create individual planning, reporting and analysis applications with the company’s own flexible multidimensional in-memory database in a familiar spreadsheet environment. However, tasks such as integrating data into Jedox OLAP Server using the vendor’s web-based Jedox Integrator product may require IT support. Trained business users can later take on responsibility for the administration and further development of Jedox applications. These applications can be published to large groups of users through Jedox Web and Jedox Mobile. 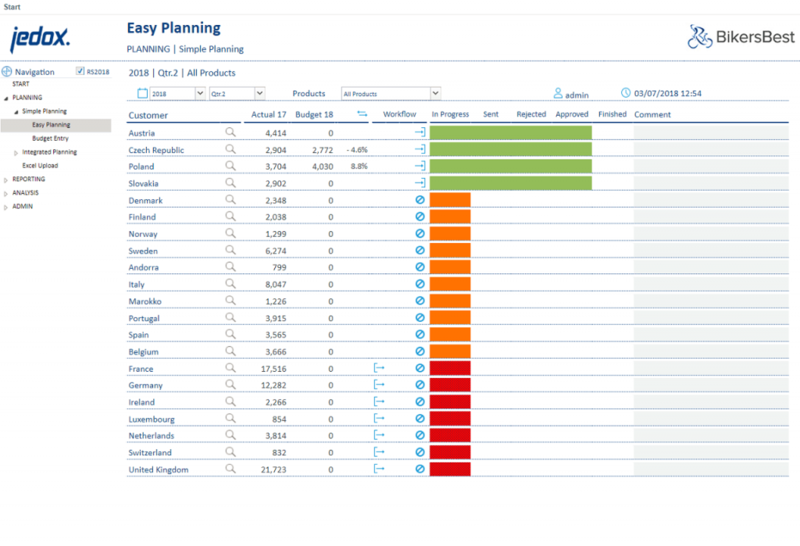 Generally classified as a development environment, in its latest versions Jedox now provides predefined planning models created itself or by partners (e.g., for balance sheet, P&L, cost center, sales and HR planning) via its own marketplace, which is integrated in Jedox Suite. 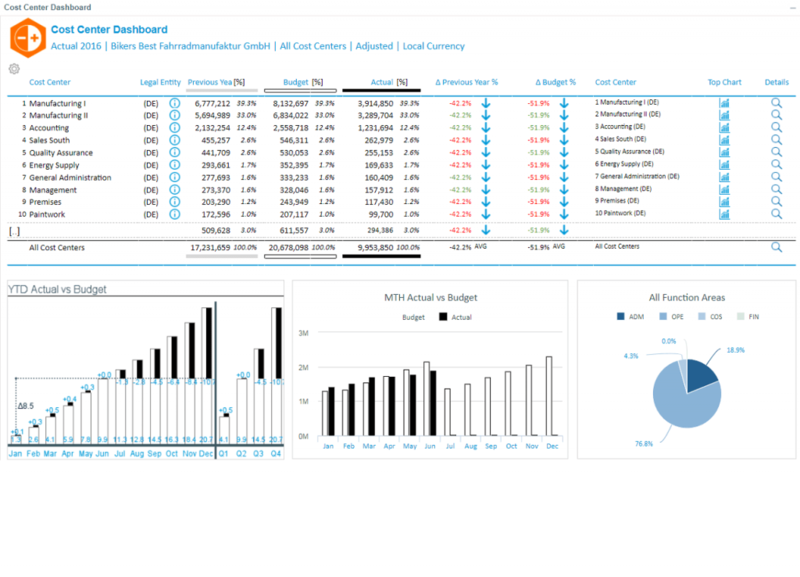 Jedox Suite is a flexible BI and CPM product with planning, reporting and analysis capabilities. 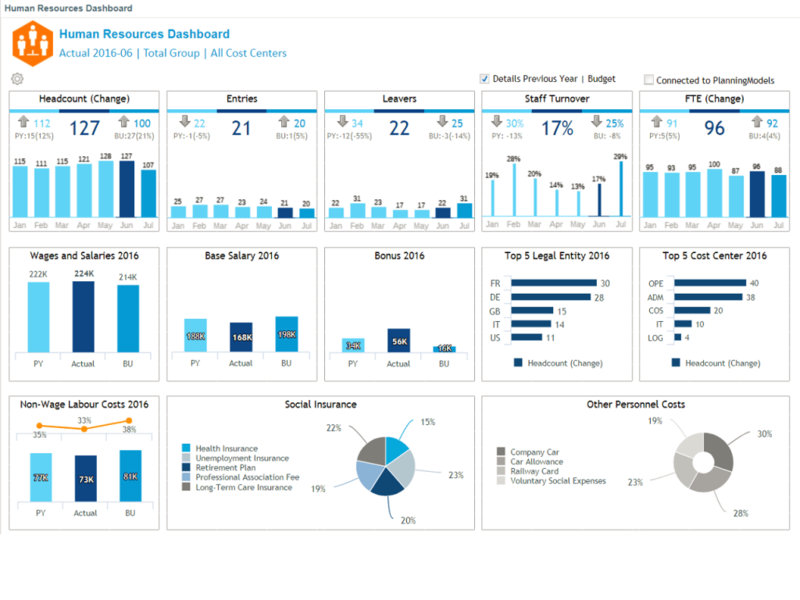 Besides its main use cases (standard/enterprise reporting, ad hoc query and budgeting/planning), Jedox is also frequently used for basic data analysis (typically OLAP) and dashboards/scorecards. 49 percent of respondents plan to use Jedox for advanced analysis in the future and 43 percent are considering enhancing their dashboarding use cases with the product. Jedox targets companies of all sizes across all industries. 72 percent of our sample of Jedox customers come from mid-sized companies (100-2,500 employees) with a median of 30 users, but the mean of 61 users indicates there are also some larger implementations. There is also a significant amount of smaller customers with fewer users (19 percent). Jedox Suite is geared to business power users with broad functionality for various BI and CPM tasks. Typical tasks carried out with Jedox by business power users include viewing, navigating and exploring data. Even tasks such as modeling/enriching data are frequently performed by customers in business departments, with little help from IT. Jedox users compared to other BI products. With its underlying philosophy of extending the familiar Excel environment with specific and flexible BI functionality, Jedox clearly meets the requirements of many companies. Consequently, many customers are satisfied with both the vendor and its BI and CPM product. BARC’s Vendor Performance Summary contains an overview of The BI Survey results based on feedback from Jedox users, accompanied by expert analyst commentary. 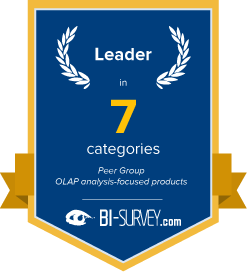 With leading ranks in numerous important KPIs in this year’s BI Survey, Jedox underpins its status as a market leading BI and CPM vendor. Companies can benefit from using Jedox Suite in terms of faster and more accurate reporting, analysis or planning, improved employee satisfaction and better data quality, which are achieved by an above-average proportion of Jedox users compared to other BI products. With its underlying philosophy of extending the familiar Excel environment with specific and flexible BI functionality, Jedox clearly meets the requirements of many companies. Consequently, many customers are satisfied with both the vendor and its BI and CPM product. Projects with Jedox are usually quite short and many customers are satisfied with their project length. The level of implementation satisfaction as well as the frequency of projects completed on time and on budget is obviously high. Project goals defined at the outset are often reached. Survey feedback shows that Jedox creates real business value for customers, and is a CPM product customers can benefit from using. Business benefits such as faster and more accurate reporting, analysis or planning, improved employee satisfaction and better data quality are achieved by an above-average proportion of Jedox users compared to other BI products. Jedox achieves leading positions for ‘Project length’ in all of its peer groups. Implementation projects are often successful and the level of support provided is highly valued by customers. The implementation support for Jedox Suite achieves leading ranks in two of its peer groups. Jedox Suite is sold by the vendor itself as well as by its worldwide partner network of around 200 value-added resellers. Alliances with big consultancies (e.g., EY) and more than 20 OEM partnerships (e.g., ERP) are major contributing factors to this good result as the level of support they provide is highly rated by customers. Partners often focus on specific solutions, industries (e.g., logistics, healthcare) or regions. Customer experience’ combines the ‘Ease of use’, ‘Self-service’, ‘Performance satisfaction’, ‘Flexibility’, ‘Data volume’, ‘Query performance’ and ‘Sales experience’ KPIs. Customers clearly appreciate Jedox’s flexible BI and CPM platform, which can easily be used by business departments thanks to its familiar, programming-free spreadsheet environment. Customer satisfaction, user friendliness for business users, flexibility and performance are key for any BI and CPM vendor to maintain a leading position in the market. Problems encountered by Jedox users are generally quite rare. Jedox delivers fast query performance (relative to the typical data volume queried). Indeed performance speed has been one of the product’s main strengths for years now. Its multidimensional database has always run in-memory so has a head start over more traditional ROLAP systems. Furthermore, the vendor’s OLAP accelerator technology, using graphics processing units (GPU) instead of CPU memory, is an interesting option for speeding up performance in large-scale scenarios if required. The vendor claims the GPU accelerator increases the processing speed of its in-memory technology “many times over”. In our experience, query performance is one of the main obstacles to achieving satisfaction and acceptance for any kind of BI and CPM product.